Go to any pharmacy today, and you’ll find dozens of homeopathic products that provide relief from a host of health issues—from stress to sinus congestion to jet lag. The fact is, homeopathy has become a widely accepted way of treating many common emotional and physical disorders. And why not? Homeopathic medicines have no known side effects, are easy to take, and are reasonably priced compared with pharmaceuticals. In response to the growing interest in this traditional method of healing, best-selling author Dr. Earl Mindell has written a simple and concise guide to understanding and using homeopathic remedies. In What You Must Know About Homeopathic Remedies, Dr. Mindell first explores the fascinating history of homeopathy. He then explains the basic medicinal principles behind this healing art, specifically, how and why homeopathic remedies work. The balance of the book is an easy-to-follow guide to the ingredients used in homeopathic formulas along with a list of common disorders and their most effective homeopathic remedies. 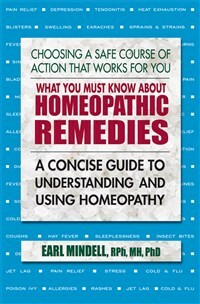 Dr. Mindell concludes the book with a chapter on what should be included in a homeopathic first aid kit. If you are one of the millions of people who are turning to homeopathic products for relief, here is a simple way to find the best formula for your health problem. If you have never considered using a homeopathic remedy, perhaps it is time to learn what all the excitement is about. What You Must Know About Homeopathic Remedies is a good place to start.